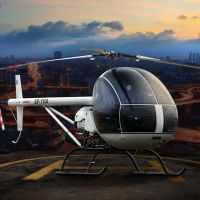 AK1-3 is a two-seater, ultralight helicopter, designed for fast, comfortable and safe travel. Excellent control, flight stability, maneuverability, low vibration and noise thanks to an ideal design balance and a three-blade main rotor. Low fuel consumption, low maintenance costs and independence from aviation specific fuel types due to the use of Pb 95 gasoline. According to Visual Flight Rules (VFR), the operating temperature range is -18 to +35 degrees celsius.